For the Super Bowl, we didn’t really watch the game or have a party, but I wanted to still have some party food. So, I made Hot Spinach Artichoke Dip, and then was trying to decide on what else. 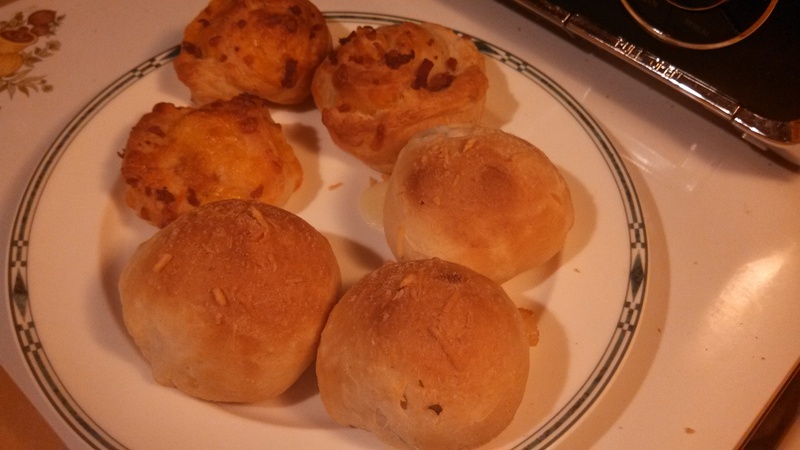 I had a can of crescent rolls, and thought back to the Bacon Cheddar Pinwheels my sister made on New Year’s Eve. I decided it would be yummy to use pesto and shredded mozzarella cheese. They turned out delicious! 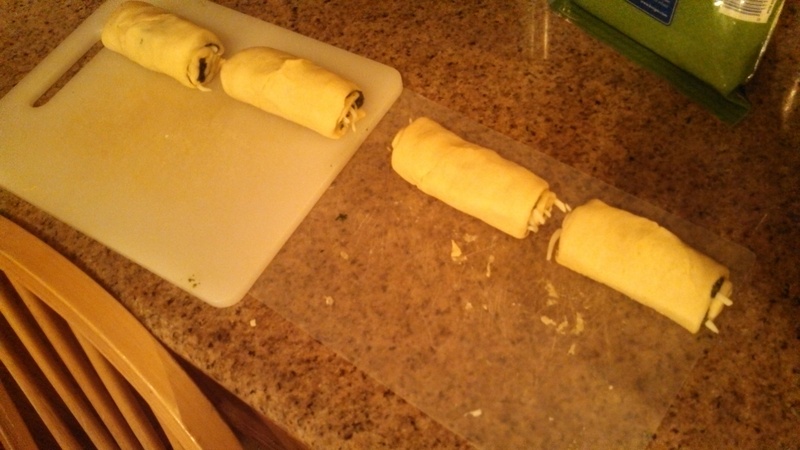 Open can of dough, unroll, and press into 4 rectangles. 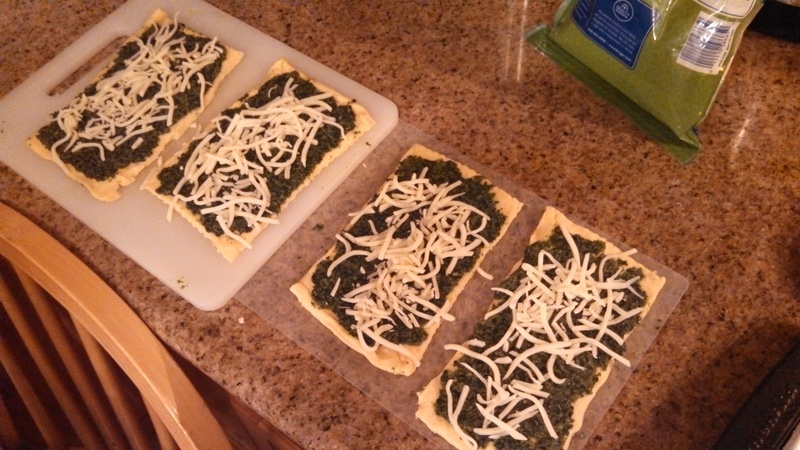 Spread pesto over each rectangle, then add shredded mozzarella cheese. Roll the dough from one side, and pinch the edge to close. 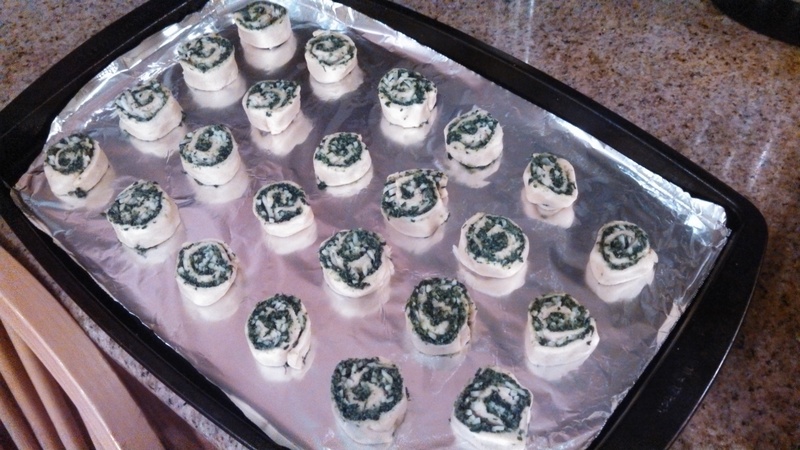 Cut each roll into about 6 pieces, placing each piece on a baking sheet. Bake in the preheated oven for 12-17 minutes, or until golden brown. 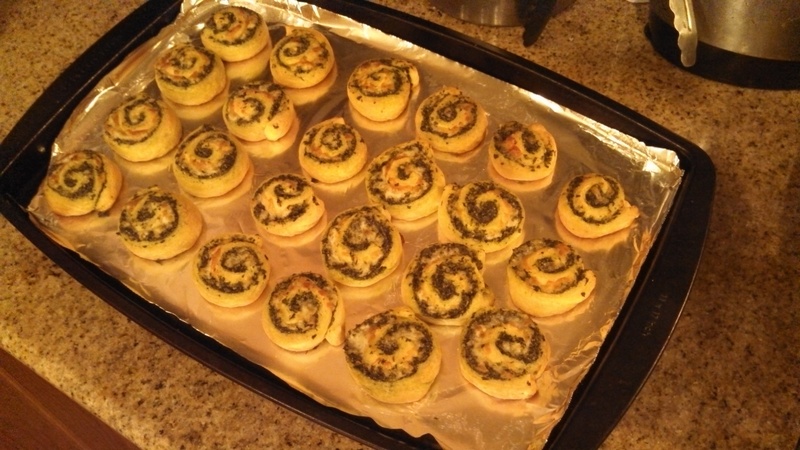 My sister and I made some yummy, easy appetizers for New Year’s Eve. The nice thing about these is that one uses crescent rolls and the other uses biscuits, which tend to be on sale fairly often. Open can of dough, unroll, and press into a large rectangle. Sprinkle bacon and cheddar evenly over the dough. Roll the dough from one side, and pinch the edge to close. Cut the roll into about 16 pieces, placing each piece on a baking sheet. Cut each Grands biscuit in half and cut each mozzarella cheese snack stick into 1-inch sections. Press each biscuit piece into a circle, and place a section of cheese on each circle. Pull up sides of the biscuit around the cheese, and press to close. Place the sealed side of each biscuit down on a baking sheet. Brush the tops with olive oil, and sprinkle with the seasonings and grated Parmesan. Bake in the preheated oven for 12-15 minutes, or until golden brown. I got a chance to try out a recipe from the 2012 Taste of Home Cooking School show that I recently attended. These are delicious! The original recipe calls for brie, but since I had feta cheese on hand, I used it instead, knowing it is a good combination with spinach and bacon. It also says to use 2 pie crusts, but I found that 1 pie crust and the filling filled the 12 muffin cups in my pan. So, since I had both pie crusts ready to go, I doubled the amount of filling and got 24 mini quiches. Yum! Preheat oven to 350 F. Spray a 12-cup muffin tin with non-stick cooking spray. In a medium-size bowl, whisk eggs together with milk, salt & pepper. Add spinach, bacon, onion, and feta to egg mixture and blend well. Roll out pie crust and cut in 3 inch circles (I used a juice glass to cut the circles); line muffin tins with circles. 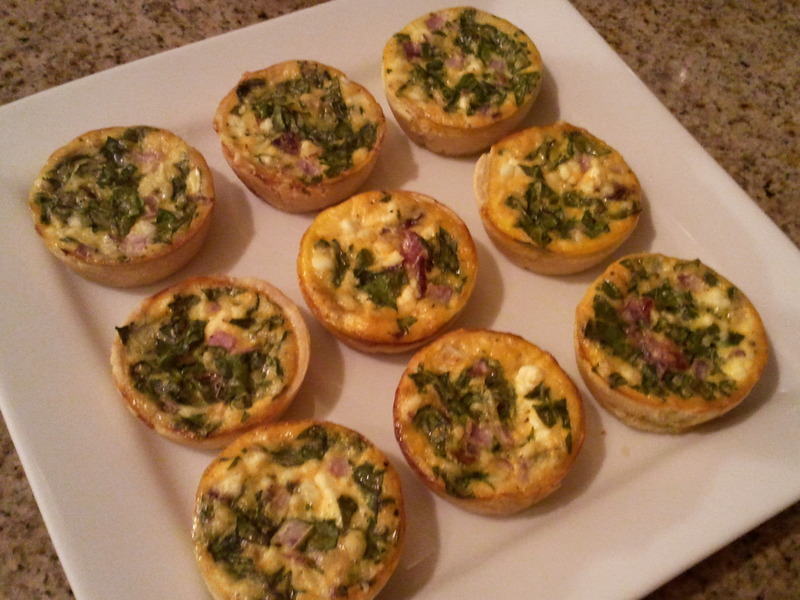 Spoon egg mixture into each muffin cup, filling 3/4 full; place in oven and cook for 25 minutes or until eggs are set. I’m not going to lie – I’m bad at breading and frying things. I’ve tried it on a few different occasions, and I did okay, but not great. Plus, I don’t like dealing with all the oil after frying. So, I searched for alternative ways to make jalapeno poppers with all the jalapenos I had . 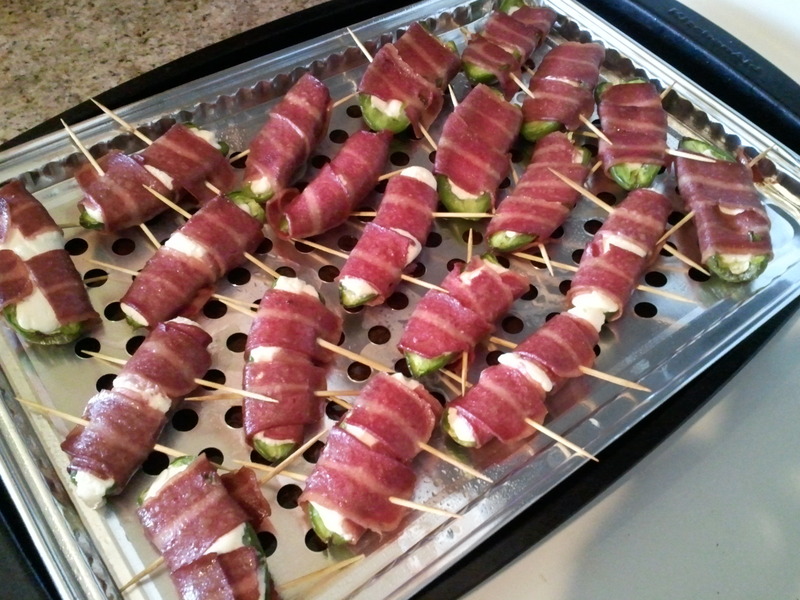 And, that search let me to Bacon Wrapped Jalapeno Poppers. You just can’t go wrong with bacon. These are really pretty easy to put together, too, the worst part is scooping out the seeds and insides of the peppers. I used turkey bacon because it’s really about the only kind of bacon we eat in my house these days, but these would be great with pork bacon too. I preferred the turkey bacon also because there is usually less grease, making less chance of grease dripping in my oven. You can also see in my picture above that I have a tray on my baking sheet. That is actually a grill cooking tray, but it was perfect to sit on my baking sheet to allow any bacon grease to drip through. An alternative to this would be to put a baking rack on the baking sheet, or line the baking sheet with foil or parchment paper. Also, make sure the baking sheet has sides to catch the grease. Grease fires are no good! If you have them, put on gloves while handling the jalapeno peppers. Slice each pepper in half lengthwise, and scoop out the insides and seeds. Scoop cream cheese into each pepper half. Wrap each pepper in a half or whole piece of bacon, depending on the size of your peppers and bacon. Use a toothpick to help hold the bacon in place around the pepper. Place on a baking sheet with sides that has a baking rack, foil, or parchment paper inside to absorb the grease. Bake in the preheated oven for 20-25 minutes, or until bacon is crispy. Note: Instead of the oven, you could also grill these. We are big fans of Olive Garden restaurant, and we don’t get to go too often. So, I decided I would try to make a couple of my favorites at home. It worked out perfectly with some of the things I had gotten from Bountiful Baskets recently. For the bruschetta, I used the Italian olive oil bread that my friend gave me this week, plus tomatoes from this week, then fresh garlic, fresh basil, and fresh parsley from the Italian themed veggie pack the week before. For the chicken, I used part broccoli, part cauliflower from this week’s basket. I wasn’t able to find the exact kind of pasta they use at Olive Garden, so I used medium shells. I think that next time I will only use half a box of pasta instead of a whole box or double the sauce, because I felt like there wasn’t enough of the sauce to really get the full taste. However, it still was very good. Toss together the tomatoes, basil, mozzarella cheese, garlic, balsamic vinegar, olive oil, salt, and pepper. Cover and chill in refrigerator for at least an hour. When ready to serve, preheat oven to 450 F. Combine Parmesan cheese and parsley. Place bread slices on a baking sheet and pinch some of the Parmesan cheese mixture over each slice. Toast in oven for 5 minutes or until bread starts to crisp. Spoon some of the tomato mixture over each slice to serve. Combine ingredients from spice mixture. Rub onto the chicken breasts. Cook chicken in the olive oil until browned, set aside and keep warm. Cook pasta according to package directions. Add broccoli and cauliflower for the last 2 minutes of cooking. Drain, return to pot. Melt butter in a sauté pan and add garlic. Cook until garlic starts to brown, then stir in the half and half and cornstarch. Simmer for 3-4 minutes over medium heat, until it thickens to a sauce. Add additional salt, if necessary. Pour over pasta and vegetable mix in pot, coat evenly. Remove from heat. 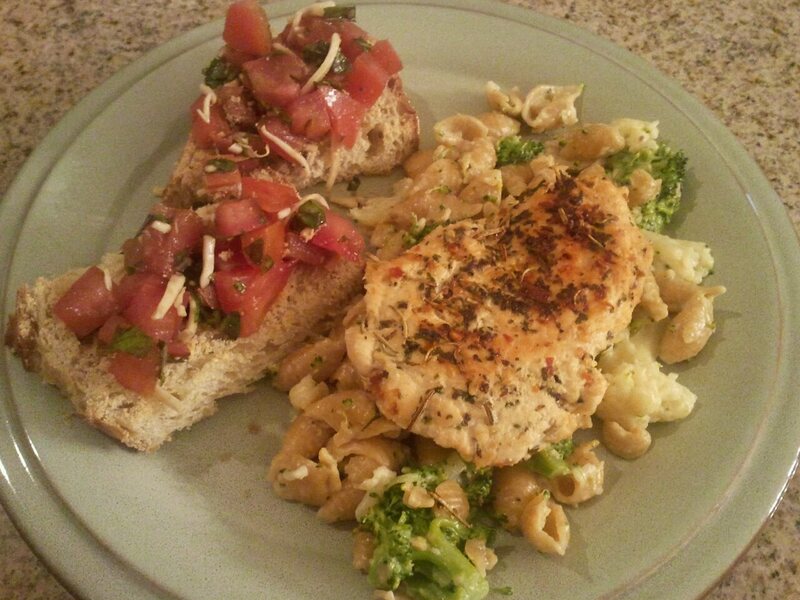 To serve, place pasta and vegetable mixture on a plate, then place a chicken breast on top. Sprinkle with Parmesan cheese, salt and pepper to taste. Does the name sound familiar? 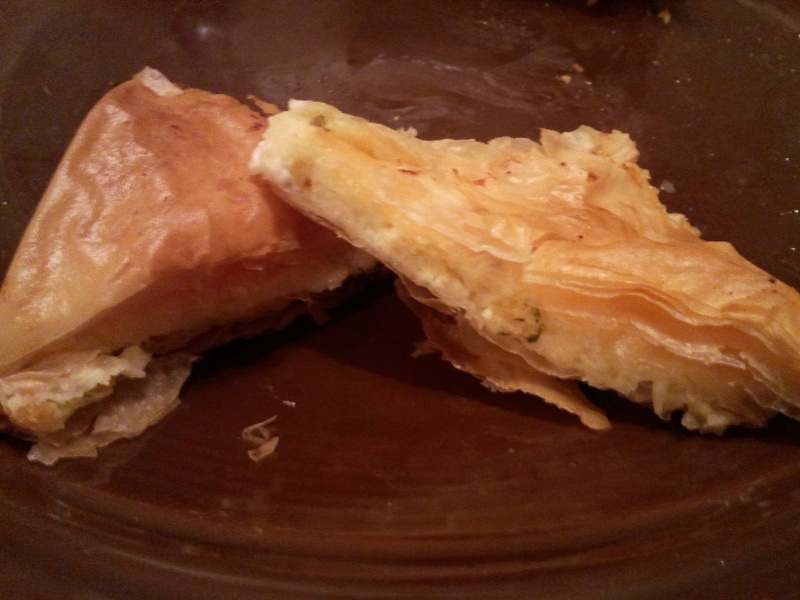 Like Spanakopita that I had posted previously? This is a cheese version of that recipe. The assembly is the same, it’s just a different filling, and just as delicious. Combine the ingredients for the filling and set aside. Brush bottom and sides of 12″ X 18″ jelly roll pan with melted butter. Lay phyllo dough in bottom of pan, and brush completely with butter. (Note: Depending on the size of your pan and the size of dough you find, you may need multiple pieces of phyllo dough to cover the bottom of the pan) Repeat the process of laying dough and buttering to create 5-6 layers of dough. Pour filling over phyllo dough and spread evenly. Place a layer of phyllo dough over the filling, again, brushing it completely with butter. Repeat the process of laying dough and buttering until you have 3-4 layers. Score through top layers of the pastry with a sharp knife. I cut mine in straight lines to make squares, then add diagonal cuts to make triangles. Pour remaining butter over. Bake for 1 hour or until pastry is golden brown (see picture at top). Remove to rack and cool for 5 minutes. Cut and serve! 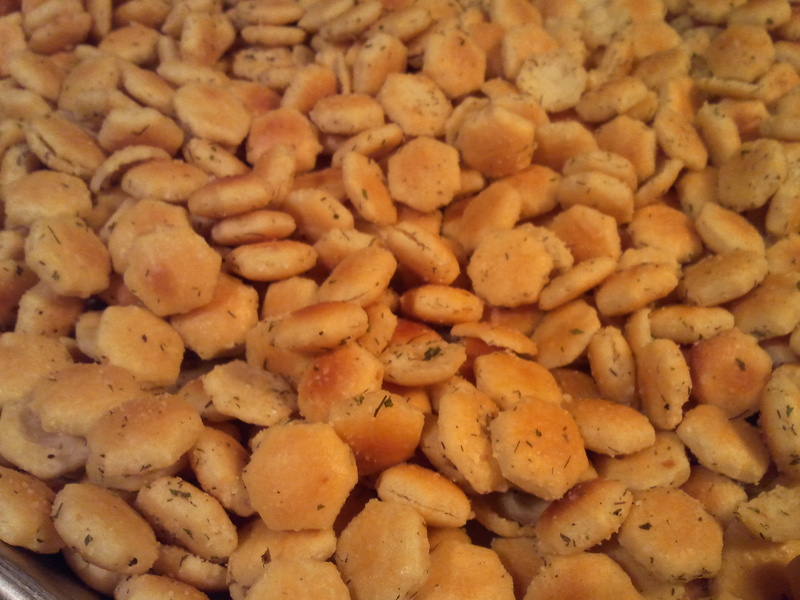 Another salty snack I like at the holidays along with Original Chex Party Mix, is Ranch Oyster Crackers. It’s very addicting like the Chex Mix, plus it’s a nice salty balance to all the sweets we make. 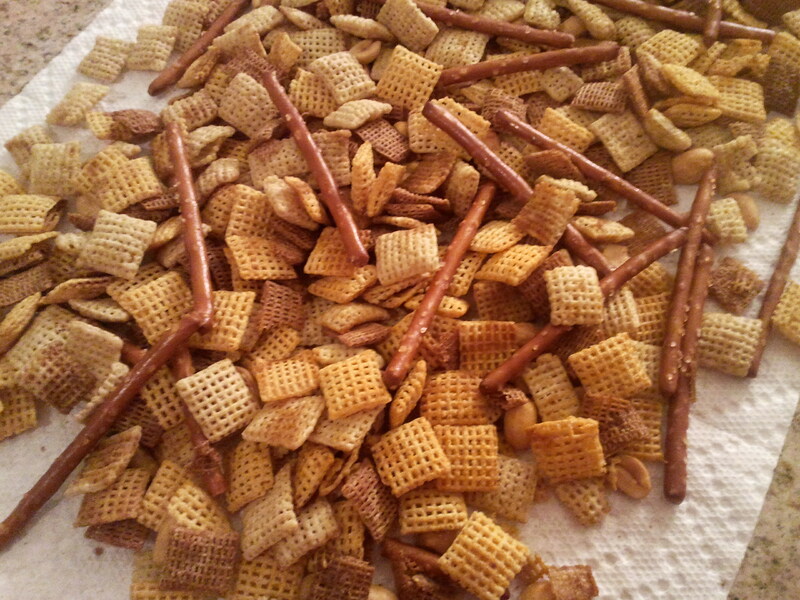 Like the Chex Mix, you may want to make a double batch so you have plenty to eat and maybe some to share. Combine ranch mix and oil. Add lemon pepper, dill weed, and garlic powder. Pour over crackers and stir to coat evenly. Pour onto a large baking sheet and bake for 15-20 minutes, stirring halfway through cooking. Remove from oven and allow to cool before serving. My mom and I have made this for years, usually for New Year’s Day. Around this time of year, Chex cereal usually will go on sale and coupons come out around the same time. Last year, they went on sale for $1.99, and the coupons were $.50 off, which doubled to $1, making them $.99 a box. Right now, at Fry’s they are $1.99 a box and there were $1 off 2 boxes Chex cereal in a General Mills insert in the 11/13 newspaper, making them $1.49 each. Now, the recipe that is out on the Chex cereal boxes today is not the same as it used to be, at least not what I remember. It seemed to change some once they started making the pre-made bagged Chex Mix sold now in stores. I will eat the pre-made mix, but much prefer the homemade mix. This recipe here is a mix of the old and new recipes. This can be done in the microwave, but I really prefer and recommend oven roasting it. It’s somewhat time-consuming in the oven, but well worth the wait. I usually end up doubling this recipe because we eat it so fast! Combine cereals, peanuts, and pretzels in a large bowl. In a separate, small bowl, combine the remaining ingredients. Pour over the cereal mixture and stir to coat evenly. Spread evenly on a baking sheet. Bake in oven for 1 hour, stirring every 15 minutes. Spread on paper towels to cool. Store in an airtight container. Prepare as above, but instead of baking in oven, put in microwave for 5-6 minutes, stirring every 2 minutes. Spread over paper towels to cool. Store in an airtight container. Oh, these are yummy! They are pretty easy to put together, just takes some time to get them all fried. I considered baking them this time instead of frying them, but my oven already had enchiladas cooking, so I decided to stick with frying them. Maybe next time I will bake them. Place chicken in slow cooker and pour salsa verde over chicken. Cook on low for 6-8 hours or high for 3-4. If you don’t have a slow cooker, cook chicken by your preferred method and mix with salsa verde. You could even buy a rotisserie chicken at the store and shred it. Next, mix cheese in with the chicken and salsa mixture. Heat oil in deep fryer or a large, heavy pot. Line a baking sheet with paper towels. Heat a small skillet over medium low heat. Place a tortilla in the skillet and heat for a few seconds on each side to make it easier to roll. 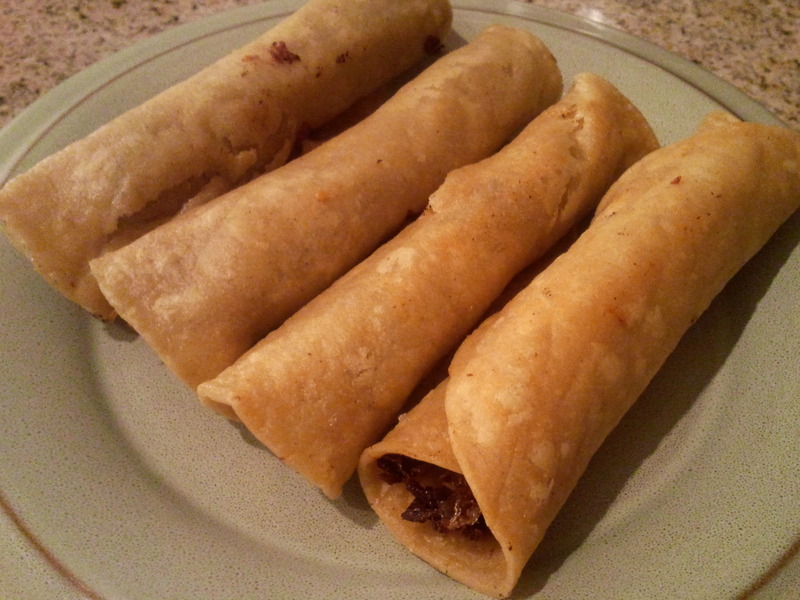 Put about 2 Tbsp of filling at one end of the tortilla and roll tightly. 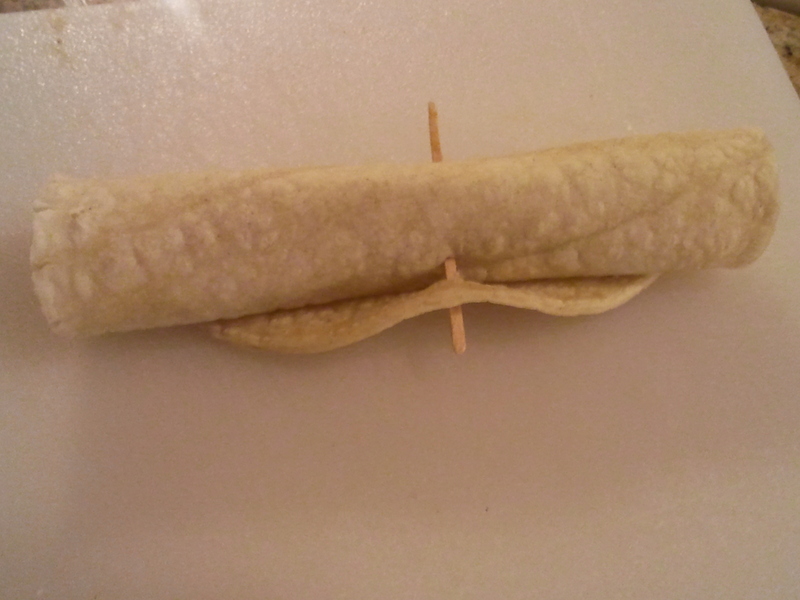 Use a toothpick in the center to keep them rolled. Repeat for remaining tortillas. Place 5-6 in oil at a time. Cook for a few minutes, or until golden brown. I don’t have a deep fryer, so I fry mine in a large pot. And, of course, I didn’t have enough oil on hand to fully cover the taquitos, so I had to flip them halfway through cooking. 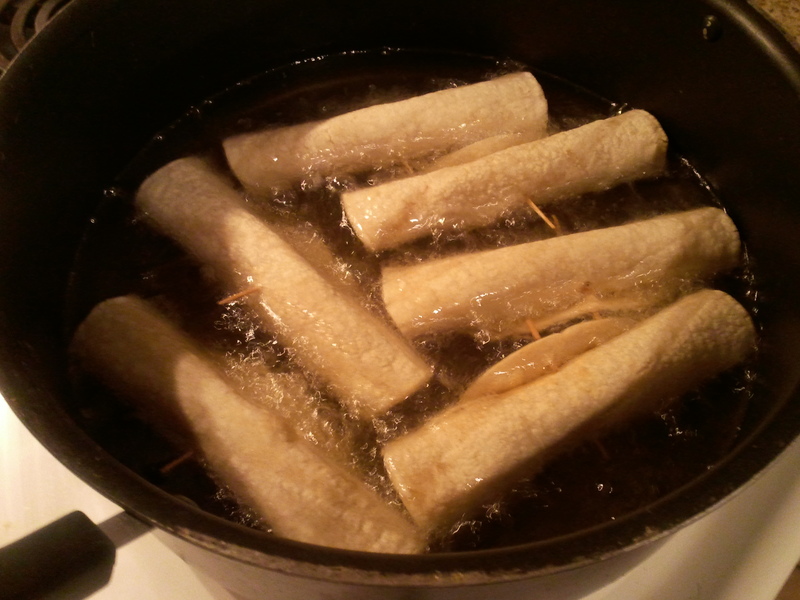 Once they have cooked, remove taquitos from oil and onto the paper towel lined baking sheet. Allow to cool, then serve.